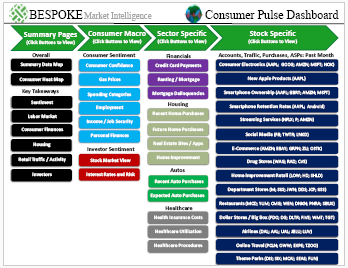 Along with our monthly Consumer Pulse Report, Bespoke’s Pulse subscription service includes access to a model Pulse Growth portfolio and a model Pulse Conservative portfolio. Both portfolios have significantly outperformed the S&P 500 since inception. Since inception in February 2016, the Pulse Growth portfolio has gained 132.5% versus the S&P 500’s total return of 58.1%. Over the same time frame, the Pulse Conservative portfolio has gained 82.5% — 24.4 percentage points ahead of the S&P 500. In 2017, the Pulse Growth portfolio gained 45.83% vs. the S&P 500’s total return of 21.82%. 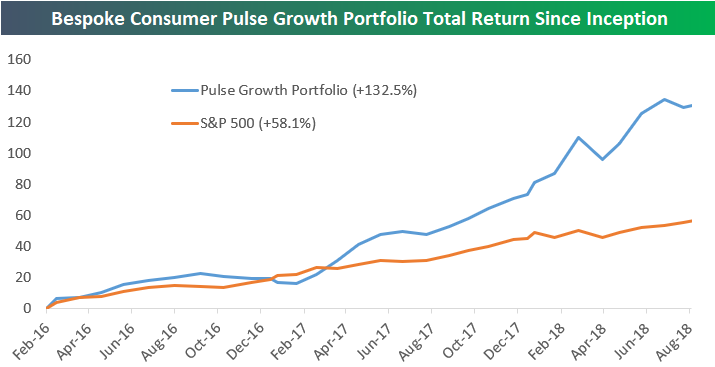 So far in 2018, the Pulse Growth portfolio is up 34% vs. the S&P 500’s gain of 9.1%. In 2017, the Pulse Conservative portfolio gained 29.79% vs. the S&P 500’s total return of 21.82%. 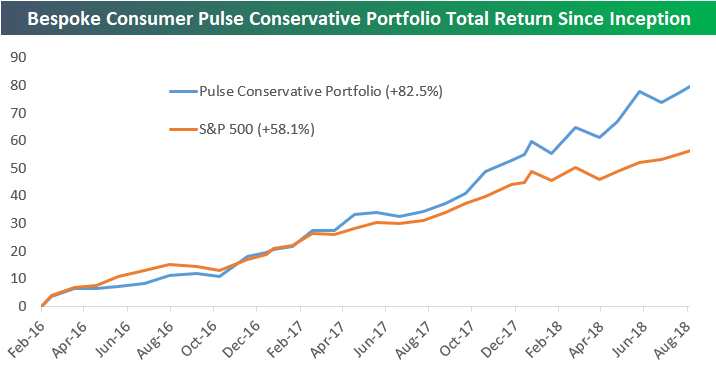 So far in 2018, the Pulse Conservative portfolio is up 17.7% vs. the S&P’s gain of 9.1%. To see the full Pulse Growth and Conservative portfolios, sign up for a 30-day free trial to our Bespoke Consumer Pulse subscription service. We provide more details on our monthly Consumer Pulse Report that’s also included with the service in the next paragraph. Bespoke’s Consumer Pulse Report is an analysis of a huge consumer survey that we run each month. Our goal with this survey is to track trends across the economic and financial landscape in the US. Using the results from our proprietary monthly survey, we dissect and analyze all of the data and publish the Consumer Pulse Report, which we sell access to on a subscription basis. With a 30-day free trial, you’ll get coverage of consumer electronics, social media, streaming media, retail, autos, and much more.